I have to admit that I am feeling a bit envious as I sit here this afternoon. Most of Australia is getting rain and we have missed out entirely. My sister says it is raining hard there and they are expecting at least a couple of inches. Greedy buggers, lol. Luckily today was very humid with the heat so I haven't had to water this afternoon. I picked a few red snake beans instead. All except 4 plants died and the ones that survived were runty little things so I have ended up with as much seed as I originally started with. I hope I do much better with them next year. The plants that I have grown outside have still not set any fruit and I am used to picking them close to winter but it is amazing to see them ripe under plastic. 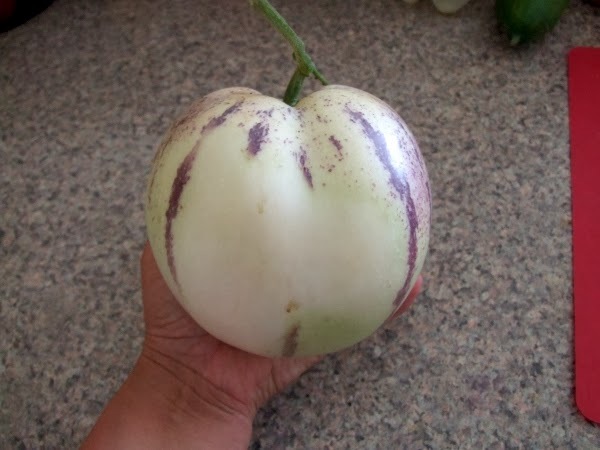 I have learned over the years to pick them slightly under-ripe, when the fruits have purple stripes but are just between the green and yellow stage. I leave them inside for a couple of weeks and they go yellow but don't lose any quality or flavour as they ripen inside. If you leave them to ripen on the bush they tend to be too ripe when you pick them and they taste awful when over-ripe. When you ripen them inside they ripen more evenly and taste just like juicy rock/musk melon. This ripening indoors stops the problem of uneveness of quality. A good pepino is delicious but a bad one, even if it looks the same, is dreadful. I like them fresh but I prefer them freshly stewed with ice-cream.